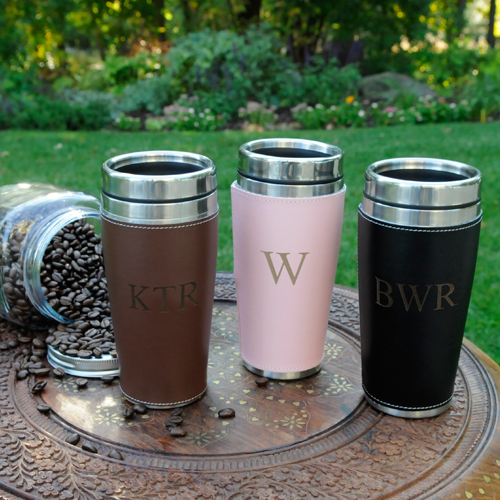 * Whether they like their coffee steaming hot or ice cold, they'll love this Personalized Executive Travel Tumbler. * This classy travel mug features a leather-look exterior with attractive edge stitching and is available in three rich colors. * Great for the office, home, or on the road, the mug includes a sturdy cap and stainless accents. * The soft vinyl cuff is removable for easy washing. * Select from brown, pink or black. * Laser engraved for a unique burned look. * Personalize with up to 7 characters.